The choirscreen of Hereford Cathedral (1862), shewn in an early 20th century postcard. Although not a feature of primitive Christian liturgy, differing forms of screen nevertheless can be traced to the early centuries of the Church. In the East, these forms developed into the iconostasis. In the West, a form of screen which separated the chancel (that place which contains the schola and the altar) from the nave of a church. 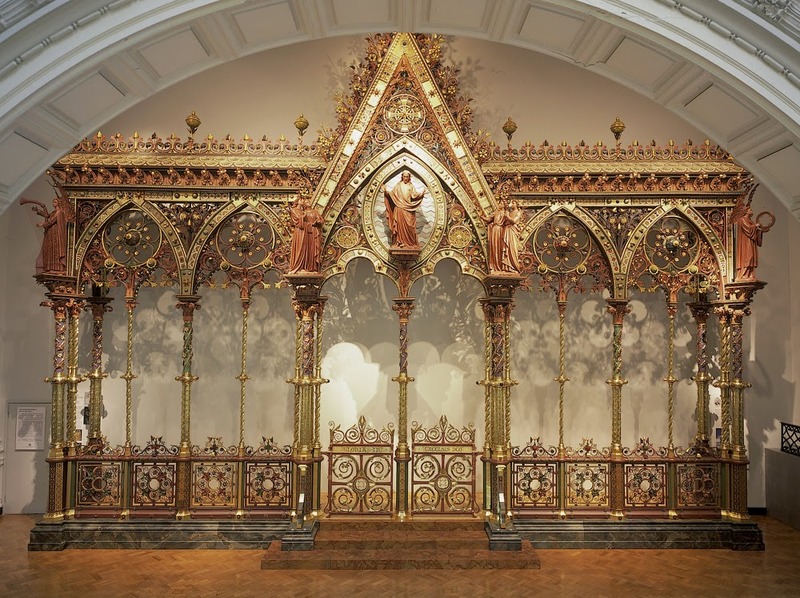 These have variously been known as Rood Screen, Pulpitum or Choirscreen, but each of these term describes a different expression of a structure which performs much the same function. There will be posts on each of these in the future in these columns. This post, however, illustrates a wonderful screen of the English Gothic Revival in the Anglican Cathedral of Hereford (UK). It embodies a second stage in the Gothic Revival, in which architects more confidently experimented with the elements of Gothic, rather than studied reproductions of particular buildings. 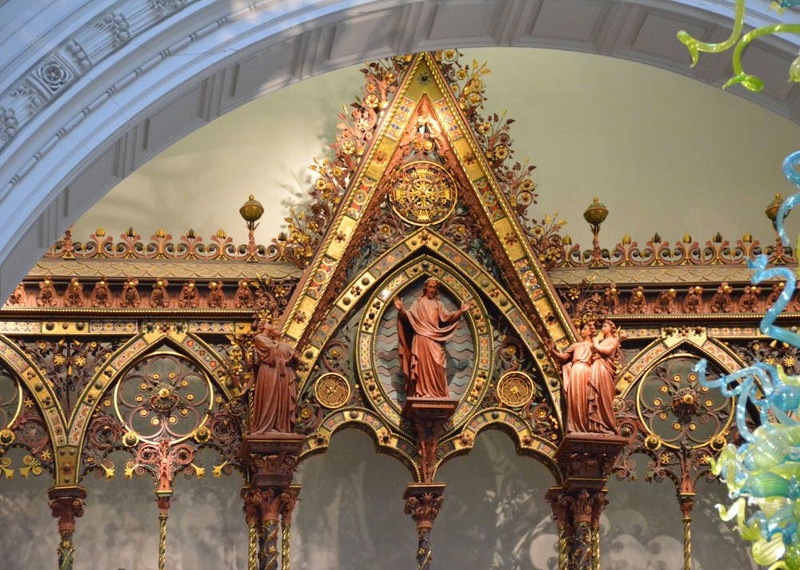 Sadly, this marvellous composition is no longer in place in the Cathedral, but is now housed, fully-restored, in the Victoria and Albert Museum (London). The following description of the screen is adapted from the website of the Museum. The great choir screen made for Hereford Cathedral is one of the monuments of High Victorian art and a masterpiece in the Gothic Revival style. It was designed by Sir George Gilbert Scott, a leading Victorian architect, and made by the Coventry metalworking firm of Francis Skidmore. 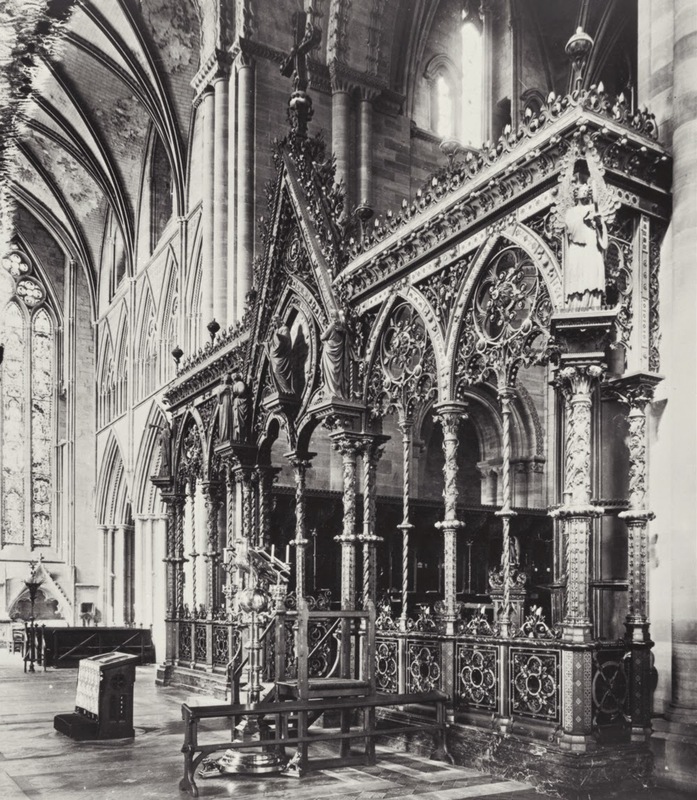 A 19th century photograph of the Hereford choirscreen. Scott's most impressive screens were largely of iron, as at the [Anglican] cathedrals of Lichfield (1861), Hereford (1862) and Salisbury (1869-72), and all were constructed by Skidmore of Coventry. Medieval screens were not made of iron - then far too costly - but always of stone or wood. Scott regarded iron as an important "modern" material and used it extensively, both structurally and decoratively. 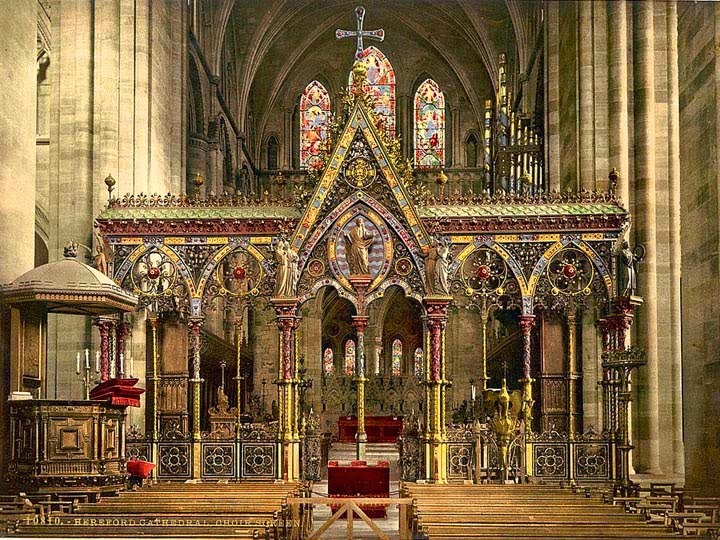 Before it was installed in Hereford Cathedral, the screen was one of the major exhibits at the 1862 International Exhibition in London, and was praised the Illustrated London News as "the grandest, most triumphant achievement of modern architectural art". It helped to win for its maker a special medal for manufacturers in metal, brass and copper, for progress, elegance of design and excellent workmanship. The screen is 10.5 m high and 11 m long and weighs over 8 tons (around 1000 kilos). Its basic structure of timber and cast iron is embellished with wrought iron, burnished brass and copper. Much of the copper and ironwork is painted in a wide range of colours. The arches and columns are decorated with polished quartz and panels of mosaic. Passion flowers in many forms are dominant motifs on the screen. They symbolise the suffering of Christ upon the Cross (the Passion). The bearded figure of Christ is the focal point of the screen. On either side, angels play timbrel and harp. The figures look as though they are made from cast bronze but are in fact electroformed copper, a revolutionary new technique at the time and much cheaper than casting bronze. Electroforming is the process of using electricity to cast a metal object. It is done through the electrical deposition of metal upon a plaster pattern or model, while it is immersed in a suitable liquid. in the secure environment of the museum. shewing our Saviour in Glory flanked by the angels. Mediaeval Churches 1 : " Saint Mary Mead "